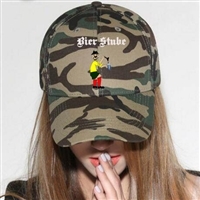 Blend in with this light camo Bier Stube baseball hat, and the multicolor logo. Model is not included. I know you were wondering. Camo pattern of final product may differ slightly from the picture. Blend in with this dark camo Bier Stube baseball hat, with the color logo. One size fits all. Camo pattern of final product may differ slightly from the picture. 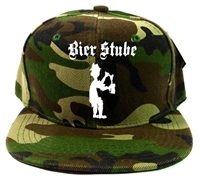 Blend in with this camo Bier Stube baseball hat with the white logo. One size fits all. Camo pattern of final product may differ slightly from the picture. Everyone loves "The Stube"! A Toledo favorite!